I Quit! ...You're hired! My First Trucking Company Pre-hire! It's been a little while since I've posted, so I thought I'd get you all updated on what's going on. Unfortunately, my CDL training school called and said my class was pushed back a week. So instead of starting this Monday, I start on January 19th. Arg! It's only a seven day setback, but it feels like an eternity! I'm so anxious to get started, so this was a punch in the gut to me. Ah well, it just gives me more time to read through the DOT CDL manual a few more times. Anyway, last week I quit my office gig. Sweet! I'm so happy I don't have to go back to that damn sales job ever again! I won't get into specific details, but that job really took a turn for the worse around July, and it was burning me up mentally. The stress was ridiculous, lots of micro-management, pay-cuts, etc. It was getting to be unbearable. So I'm really happy I don't have to walk through those stupid front doors of that stupid office building anymore. Just like in the movie "Office Space" those doors shocked me almost every single day I went in. Oh how I cringed touching those door handles every morning. No more of that! I left the company on good terms. As much as I really wanted to pull a true "Office Space" and see how long it would take me to get fired from that hell hole, I'm a firm believer in never burning bridges. So I bit my tongue, told my manger how much of a pleasure it was working there and how much I appreciate the experience, yadda, yadda. He asked where I was going and I was straight up with him. Told him I was going to be a truck driver. The look on his face was priceless! Sort of like a "why in the hell would you ever want to do that?" look, but at the same time I could tell he didn't want to come out and say it. So he just said, "Well, good luck with that," in a snotty tone. Needless to say, just like most corporate gigs, I was walked out of the office almost immediately, even though I offered to work through next week. Good riddance! It feels so awesome to be out of there, but pretty scary at the same time. Now I really have to concentrate on my finances. CDL training is four weeks long and then who knows when I'll start working at a trucking company? Could be a few weeks after that before an orientation date starts. One piece of advice I got was to file for unemployment. Yes, I left on my own terms, but filing for unemployment is free and there is no penalty if you get denied. So why not give it a shot? Hopefully, if I qualify, they will pay for my CDL training as well (or at least some of it). You have absolutely nothing to lose by filing for unemployment. A bit of good news though. The day after I quit my office job I got a call from one of the trucking companies I really like. I officially got a pre-hire! For those of you who don't know, a pre-hire is basically an offer for employment on the condition a CDL-A license is successfully obtained through an approved CDL driving school (any state accredited school works for this company). So as long as I get through training and obtain my CDL, I'm in! 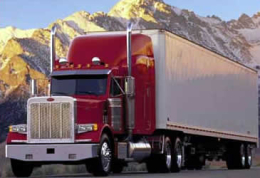 Don't wait until you already have your CDL to apply. Start applying early and get that pre-hire! I have to admit, during this economy, I was a little nervous about finding a truck driving job. But I haven't even started my CDL training yet and already have a job offer! How cool is that?? While this is definitely the company I want to go with, I'm going to continue applying to other companies and obtain more pre-hires. I'll even be applying to companies I don't really like. I just want to plan for a worst case scenario and have several options, just in case. - Have you ever been convicted of a felony? - Have you ever been arrested for a drug or alcohol charge? - What is your driving record like? Any tickets? DUIs? Reckless driving? - Where do you live? That's about it! I wasn't asked why I wanted to get into truck driving, why I want to work for their company, what my plans are in 10 years, my strengths and weaknesses...none of the questions you'd really expect in a typical interview. All they really seem to want to know is if I meet all of their basic qualifications. Simple enough! Since I spoke with the recruiter just before Christmas, she said to call back the first or second week of January as she was going to be on vacation. They needed some time to verify my employment history, criminal record, etc. She ended up calling me last week to let me know I'm pre-hired. For those of you who are worried about the economy and finding trucking jobs, stop worrying about it. The recruiter was disappointed I wouldn't be done with training for another month. She said they need people and they need them now. Apparently they have "no empty trucks" right now and are staying "very busy" and "hurting for drivers." If you're going OTR , you'll be fine. 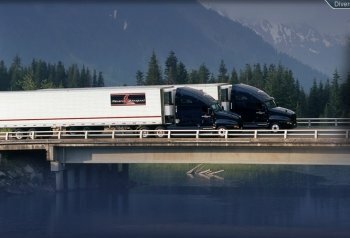 Drivers are still needed out there, contrary to what many online trucking forums will tell you. We even have a couple articles that talk about how job losses in the economy will not hurt truck drivers and how layoffs in trucking will not hurt your chances of finding work in the trucking industry. And if you still don't believe me, take a look at the tons of truck driving jobs we have on the site! On Monday I'm going in for my DOT physical. I've been looking around online and haven't found much info on this, so I'll be sure to write about it in full detail on Monday evening or Tuesday. So be sure to check back early next week so you can see exactly what the physical entails. I also bought an iPhone last week. You may recall in one of my previous blogs that I was trying to decide what phone to get. I was a bit torn between the iPhone and the new Blackberry Storm. Well, after much research, I did end up deciding on the iPhone through AT&T. This phone is freakin' sweet! There really isn't any other way to describe it. And the 3G speeds for surfing the web on the phone is lightning fast. So far, reception around my local area has been about the same if not better than my old Sprint service. So I hope that rings true when I'm out on the road. Once I get a bit more experience with this phone and learn all the features, I'll post up a little review on what I like and what I dislike. But for starters, I can tell you that the iPhone is leading the way for the future of cell phones. I have absolutely no complaints so far about the phone and my jaw continues to drop at the features and available downloadable applications for this phone. I've only downloaded a few free applications, but most are no more than 2 or 3 bucks. This thing rocks! Enough said. Other than that, not too much happening right now. I've just been busy wrapping up some loose ends. Had a dentist appointment last week and I'll be going in for a full physical in addition to my DOT physical. I figure I might as well take advantage of my health benefits before they expire. I'm going to get a passport this week too. I figure it's something I should have anyway, but especially if the possibility is there for me to travel into Canada while driving. So I'll keep you all posted and if you have any specific questions on anything, please either post a comment or feel free to email me at the address listed at the top of the page! Thanks for reading my blog and until next time, drive safely!